[Satnews] A new year brings new change, focus and even greater expectations, as Space Tech Expo—co-located with Aerospace Electrical Systems Expo—continues to expand in scope, as well as exhibitor and attendee numbers. With many new exhibitors welcomed, including: BAE Systems, AeroVironment, NASA AFRC and JPL, January saw the most activity in the show’s five-year history, signaling continued excitement and business opportunity for the industry in 2016. With revenues in space and satellite manufacturing continuing to grow year on year, the event looks set to beat last year’s 45 percent increase in attendance figures and 25 percent increase in exhibitors, as visitor registrations are already tracked higher than this time last year. 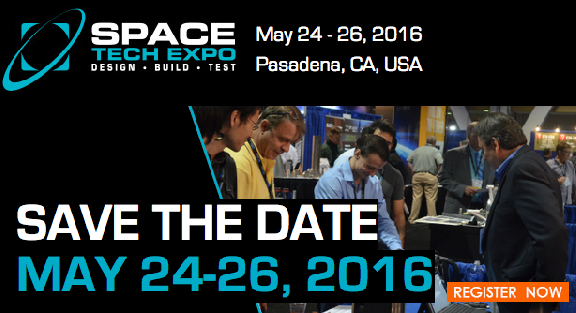 Fifty-two companies signed up to exhibit in just one month, meaning Space Tech Expo 2016 will host its largest event ever, with 230+ exhibiting companies and 1,700+ participating companies joining the show in Pasadena, California, May 24-26, 2016. The venue moved from Long Beach to Pasadena has been widely supported by the local space and aerospace businesses, with JPL not only exhibiting but also featuring in the Space Tech Conference proceedings, with Deputy Director, Gen. Larry James presenting a keynote address. Confirmed speakers include Claire Leon, SES, DAF, Director - Launch Enterprise, Space and Missile Systems Center; Michael Gazarik, Vice President - Engineering, Ball Aerospace; Steve Stich, Deputy Manager, Commercial Crew Program, NASA; Mark Rawlins, Chairman, Space Data Association, and Director of Communication System Operations, Eutelsat; Jim Keravala, COO, Shackleton Energy Company. To view the Space Tech Conference agenda, please select this direct link.